Well, after several weeks of planning and around 30 hours of beading, I have finished my piece for the Maven Meld challenge. And to show it off, I've finally got around to buying some proper jewellery display equipment! Purchased from ebay, I bought a display bust in white leatherette, and a matching bracelet display rack. 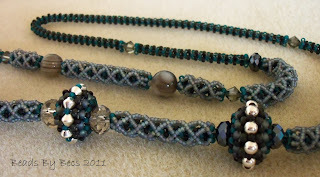 Please do have a look at the other entries for the Bead Maven Challenge - on their blog, or their facebook page. I'm very excited about the bangle rack though - as I love making bracelets, being able to show them off properly at last is great! And a gorgeous entry it is, too! Thanks so much for choosing my tutorial to work with, Becs! Great bracelet display, too - I SO want one in black!! I love everything about this stunning meld - the blues, blacks, grays, teals - they bring to mind the power and majesty of a stormy sea. Beautiful work! Glad I found your lovely blog! Wow! You did a great job on that meld! Love the colors you chose, and the combination of designs is awesome!